Mechs redirects here. For the miniatures set published by German licensee FanPro in 1992, see ...Mechs!. 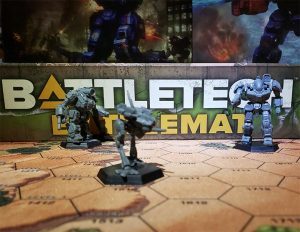 In general, BattleMechs are considered superior to conventional combat vehicles, being faster, better armed and better protected, creating a firepower-to-manpower ratio which also gives them a logistical advantage. 'Mechs replicate many of the movements humans are capable of performing, including acrobatic feats such as shoulder rolls, which allow them to avoid, deflect or otherwise lessen the impact of weapons fire. Their downside is the incredible expense associated with producing and maintaining 'Mechs - even the cheapest 'Mech can cost millions of C-Bills - ensuring cheaper combat vehicles a continued role in warfare. Still, the best way to fight a 'Mech is with another 'Mech, preferably one larger and more powerful: duels between evenly-matched 'Mechs have been known to last for hours. The genesis of BattleMech technology began in the Terran Hegemony with the works of Dr. Gregory Atlas, the leader of a top-secret Hegemony Research Alliance Department project known as "Operation Musclebound" at the University of Zimbabwe. In 2350, Dr. Atlas had succeeded in refining myomer technology such that it was smaller and required less energy yet capable of impressive strength. Honored for his achievement in 2351 by being given a peerage, Dr. Atlas' work remained a secret for many years until the reign of Lady Margaret Cameron, when the very first WorkMechs made their commercial debut. The military applications of such technology was apparent, and further research and development continued over the next few decades. On 3 February 2439, as the Age of War gripped the Inner Sphere, the first combat trial of a new prototype BattleMech, the Mackie, was carried out near the city of Yakima in North America. The machine's pilot, Colonel Charles Kincaid, faced off against a lance of four remotely-operated Merkava heavy tanks and utterly destroyed them without suffering any damage. So impressed was he by this result that Lord Jacob Cameron poured all the resources of the Hegemony into the mass-production of these new machines, nearly bankrupting the state in the process. The introduction of the Mackie was kept secret for a few more years as the Hegemony Armed Forces waited for the right time to unveil it. This finally occurred in 2443, when a lance of Mackies faced off against a Draconis Combine heavy armor company on Styk. A single tank survived the encounter and retreated back to its DropShip, and with it word of this new weapon of war spread throughout the Inner Sphere. The other major powers coveted the Hegemony's new BattleMech, and set about trying to acquire it themselves. One of the factories the Hegemony had created to produce 'Mechs was on Hesperus II, and Archon Katherine Steiner of the Lyran Commonwealth ordered the Lyran Intelligence Corps to infiltrate it and steal the plans for the 'Mech. However, after six years of trying, the best the LIC could do was get a single person inside to make a map of the facility. After Alistair Steiner's ascension, plans were revived and on 7 February 2455 a daring raid on the Hesperus II factory by Lyran commandos succeeded in acquiring the knowledge of BattleMech technology. The Commonwealth fielded their first BattleMechs in 2459, and with the secret of BattleMech construction out in the open it soon spread to the other Great Houses, though each in their own manner: the Federated Suns acquired it through negotiations and a hefty payment to the Commonwealth in 2457, while the Draconis Combine simply took it in their own commando raid on the Lyran's Coventry 'Mech factory in 2461. The Free Worlds League managed to convince a Lyran scientist to defect to them in 2462, only for the Capellan Confederation to do the same to them four years later. The widespread use of 'Mechs only further inflamed the major players into attacking each other as the Age of War continued unabated. The Age of War came to an end with the formation of the Star League, but development of new BattleMechs continued, with the Star League Defense Force fielding increasingly more potent machines. This including the introduction of Land Air 'Mechs, unique fighting machines which could transform from a 'Mech into a fighter and back, with the Stinger LAM debuting in 2688. That progress came to a halt after the Star League Civil War and the exodus of the surviving SLDF units. The dissolution of the Star League plunged the Inner Sphere into centuries of interstellar warfare soon known as the Succession Wars, a technological and cultural dark age in human history. In the intense fighting which laid waste to whole planets, much of the knowledge and technology humanity had gained became Lostech as factories were destroyed, centers of learning demolished, and technicians and scientists killed. BattleMech designs similarly regressed: those which could still be built had to make do with inferior components, while many effectively became extinct as spare parts ran out. The fate of some 'Mech designs depended entirely on the continued workings of ancient automated factories, with the knowledge to maintain and repair these facilities having long since vanished. Entire planetary invasions were sometimes based around seizing surviving examples of 'Mechs whose production lines had ceased to exist. Even ComStar, which preserved many original Star League 'Mechs in secret, could not prevent the wholesale disappearance of some 'Mech lines. Over time, equipment shortages, system failures and similar problems sparked innumerable variants of the classic designs, with field modifications and makeshift repairs commonplace. It was the rediscovery of the Helm Memory Core in 3028 which halted this continued technological decline and played an important role in revitalizing BattleMech development. Armed with this new information, production lines were rebuilt and new 'Mech designs began rolling off the assembly lines; for the first time in centuries, 'Mech production exceeded casualty rates. BattleMech development in the Inner Sphere received a major shock during the the invasion of the Clans in 3050 as it got its first look at technology advanced even beyond that of the Star League. Estranged from the rest of humanity for centuries, the SLDF exiles had become the Clans and were spared the ravages of the Succession War, allowing 'Mech development to continue unabated. Building on a concept first hinted at in the Mercury, Clan Coyote had introduced the first OmniMech, the Coyotl, in 2854. The OmniMechs used in the Clan invasions were even more potent and struck fear in the hearts of the Inner Sphere defenders. Not knowing what their actual designations were, many picked up new nicknames in the battles between the Clans and Inner Sphere: the Summoner was dubbed as the Thor by House Steiner's forces because of its deliverance of "thunder and lightning" by its Autocannon and PPC; the Dire Wolf became known as Daishi ("great death") among forces of House Kurita; and the Timber Wolf became the Mad Cat because the battle computers of Inner Sphere 'Mechs alternated between Marauder and Catapult when they tried to identify the unknown design. BattleMechs are built around an internal structure resembling a skeleton, including joints (actuators). Most 'Mechs copy the human form to an extent, which is the the deciding factor in their versatility and, ultimately, their superior combat performance. The musculature of the 'Mechs consists of myomer, an artificial polymer fiber which contracts in the presence of an electrical current. The artificial skeleton and musculature, combined with a large gyroscope system, provides stability for the BattleMech and allows for bipedal movement. Some 'Mechs have jump jets that provide thrust bursts for short leaps. BattleMechs are controlled by pilots known as MechWarriors. Seated in the cockpit of their 'Mech, MechWarriors connect to their machine by wearing a neurohelmet, which reads their brainwaves in order to provide the 'Mech a sense of balance and other necessary functions. Through the combination of neurohelment and physical controls, the pilot can control the 'Mech, making it run, jump, and even do handstands under the right circumstances. Assisting the pilot is the Diagnostic Interpretation Computer, which among other functions takes information gathered by the Sensors and other systems and presents it to the pilot in an understandable format. Being built to BattleMech standard includes a Life Support System for the MechWarrior (and possibly a passenger) and full Environmental Sealing by default, except for special cases such as drone 'Mechs. The power required for the motive systems, computers, and other systems is provided by a Fusion Engine mounted in the torso. Although all 'Mechs have heat sinks, heat buildup is a frequent problem. Intense combat action can lead to overheating that puts physical strain on the pilot, and may even cause an emergency reactor shutdown. BattleMechs carry weaponry which broadly falls under one of three categories. Ballistic weapons, such as Machine Guns, Autocannons and Gauss Rifles, produce little waste heat but require ammunition and have greater weight and space requirements. Energy weapons, such as Lasers, Particle Projection Cannons and Flamers, require no ammunition and take up less space but produce tremendous waste heat. Missile weapons, including Long Range Missiles and Short Range Missiles, produce less waste heat but require ammunition, with the benefit of using specialty warheads like Inferno or engaging in indirect fire. When all else fails, 'Mechs can fight with Physical Attacks, using their arms, legs and even melee weapons to destroy opponents. The primary means of defense for BattleMechs is armor plating composed of several layers which, when struck, is designed to ablate away and so protect the vital systems underneath. Additionally, all 'Mechs incorporate electronic warfare capabilities which it harder for less advanced targeting systems to lock on to them. For example, the paint used to coat 'Mechs contains properties designed to absorb electromagnetic radiation. Some 'Mechs also rely on their speed and agility or their unique geometry to make themselves a harder target to hit. Humanoid-type BattleMechs with knee-joint legs are the most commonly encountered BattleMechs; iconic 'Mechs of this kind include the Wasp, Phoenix Hawk, Warhammer, Atlas and Summoner (Thor). Reverse joint (chicken-walker) bipedal 'Mechs are slightly less common on the field of battle, but include such famous 'Mechs as the Locust, Catapult, Marauder, and Timber Wolf (Mad Cat). Digitigrade bipedal mechs that have hip, knee, ankle, and toe joints and walk on their toes are the rarest of the three. Examples include the Thanatos, Nova Cat, and Mongoose. 'Mechs normally have two or four legs. Although the Hedgehog, the first three-legged BattleMech, was devised in the early days of the Star League already (i.e. around 2600), the concept remained obscure for centuries and three-legged 'Mechs were even rarer than ultralight 'Mechs. It was not until the colossal Ares and superheavy Poseidon BattleMechs which appeared in the early 3130s, followed by the heavy-class Triskelion in the 3140s, that tripodal 'Mechs became more than an obscurity. The Quad 'Mech uses its "arms" for legs which gives these designs some additional stability and maneuverability (such as sidestepping, also known as lateral shift movement). The concept was much maligned for sacrificing the overall versatility of BattleMechs and the early designs, notably the Scorpion and the Goliath, proved flawed, being notoriously difficult to maintain and highly susceptible to breakdowns. It was only around the year 3060 that improved technology led to new quadrupedal 'Mech designs, although the stigma associated with the general concept still lingers. Bipedal BattleMechs remain the vastly more common 'Mech. A special, and very rare, type of BattleMechs based on common designs, the Land-Air 'Mechs (aka LAM) can transform from a regular BattleMech form into an Aerospace Fighter, or an intermediate form referred to as LAM Mode. While performing just like a conventional BattleMech or Aerospace Fighter in the respective form (to the point of being kept in either 'Mech bays or fighter hangars aboard DropShips), in LAM Mode these 'Mechs can quickly traverse great distances, giving them a tactical advantage in ground combat although their real niche apparently is reconnaissance. However, their delicate technology is unduly susceptible to damage and the combat performance of Land-Air 'Mechs fell short of expectations by a long margin, especially considering their exorbitant production and maintenance costs. Land-Air 'Mechs were only produced in small numbers and the ability to maintain and repair (or even produce) them was largely lost early on in the Succession Wars. The concept quickly faded into obscurity from a combination of small numbers, maintenance shortfalls and combat attrition. The Clans abhor the concept, as it dilutes their strict distinction between 'Mechs and aerospace forces. Clan Nova Cat famously took great care to raze the last remaining LAM factory to the ground during the Clan Invasion. Only Clan Jade Falcon is known to have delved into LAM research, but the project was terminated in 3059 after only two prototypes had been built. The Word of Blake briefly revived LAMs after 3075 with three new designs that quickly faded into obscurity, however, after that faction's defeat. A variation of the LAM-type BattleMech, the QuadVee is a hybrid of quadrupedal 'Mechs and combat vehicles and has conversion equipment to switch between two modes. The QuadVee was developed by the Clan Hell's Horses during the later part of the Dark Age Era. Its creation was a means for the Clan to bolster its touman. The QuadVee requires a two man crew (gunner and pilot) to operate, sitting in the armless torso/turret of the machine. The vehicle form can be equipped with either tracks or wheels. Unlike most Quad Mechs, the QuadVee has a turret-like torso that may rotate 360 degrees. This is typically where most of the QuadVee's weaponry is housed. 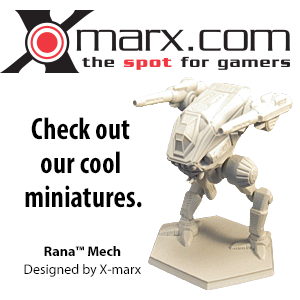 These 'Mechs are currently available in normal BattleMech weight classes. A QuadVees may continue to move even if the gyro is non-functional by converting into vehicle mode. They are able to be setup to be either a standard QuadVee or modular, as an OmniQuadVees. In the few years the Hell's Horses have utilized it, the vehicle has received mixed reviews. Although it is technically possible to build "ultralight" 'Mechs of 15 or even 10 tons, most 'Mechs in this range are IndustrialMech designs. Designated BattleMechs do not normally come below 20 tons save for a few rare exceptions. Some agencies, namely including the Draconis Combine Mustered Soldiery, define a BattleMech as massing at least 20 tons and therefore do not consider ultralight 'Mechs proper BattleMechs. The arguably most famous ultralight design (and also the first that was ever published) is the FLE-14 subvariant of the Flea, massing 15 tons while most other variants weigh in at 20 tons. Ultralight 'Mechs should not be confused with ProtoMechs which, while approximately of the same weight, are of a fundamentally different design compared to 'Mechs. All 'Mechs weighing from 20 up to 35 tons are classified as "light". Their skeleton can only carry limited armor, but the higher efficiency of smaller fusion reactors means that light 'Mechs benefit from superior mobility. They are typically fast but lightly armed and armored. These 'Mechs are generally used as scout 'Mechs and anti-personnel units instead of frontline combat duty, but some are designated combat 'Mechs with relatively heavy armament. Their low production cost, high proliferation, and relatively good supply of spare parts meant that they saw widespread use throughout history in virtually any role. Famous light scout 'Mechs include the Locust, Stinger, and Wasp, while the Commando, Jenner, and Panther are powerful combat units for their size. Clan technology provides their designs such as the Adder (Puma) with firepower equalling Inner Sphere 'Mechs twice their size. Notable specialized light designs include the Ostscout Recon 'Mech with its advanced sensor gear, the Raven ECM 'Mech, and the Firestarter Incendiary 'Mech. Medium 'Mechs are the workhorse 'Mechs of most armies. Weighing between 40 and 55 tons they naturally fall somewhere in between the agile light 'Mechs and the powerfully armed heavy 'Mechs. While matching neither in their respective niche, medium 'Mechs tend to have the best combination between speed, armor, and payload which gives them unmatched versatility. The fastest medium 'Mechs often serve as command units among light 'Mechs with similar speed. Better armed than light 'Mechs, medium 'Mechs can often outmaneuver heavier opponents in combat and bring their weapons to bear with better effect to the point of being superior combatants in single combat, given time and suitable terrain. Common medium 'Mech designs include the Phoenix Hawk, Vindicator, Centurion, Shadow Hawk, Griffin, and Wolverine, and the Clan designs Nova (Black Hawk) and Stormcrow (Ryoken). Heavy 'Mechs are those designed for frontline combat duty, and weigh in between 60 and 75 tons. They are slightly less versatile and generally slower than medium 'Mechs, but tend to have much heavier armor and weapon payloads. Capable of delivering sustained heavy fire over long ranges while retaining adequate mobility, they are formidable and powerful foes. Some designs are adapted to special roles in combat which greatly improves the combat performance of their unit but makes them a poor choice in single combat situations. Typical examples of heavy 'Mech designs are the Crusader, Thunderbolt, Warhammer, Marauder and the Clan Mad Dog (Vulture), Summoner (Thor) and Timber Wolf (Mad Cat) designs. The Rifleman is notorious for its anti-air capabilities, and the Archer for its long-range missile barrages. Assault 'Mechs are the heaviest regular class of BattleMechs, weighing in between 80 and 100 tons. Some of these huge 'Mechs can mount up to 50 tons of weapons as well as very thick armor protection. They can project tremendous firepower, and perform best as the spearhead of frontal assaults or in defending entrenched positions. The trade-off is in speed and maneuverability, as assault 'Mechs are generally very slow. As such, they often require friendly units to protect them from being outmaneuvered. Assault 'Mechs are typically used as command units, heavy assault platforms, and in fire-support roles, but due to their prohibitive costs and limited production, they actually make up only a small fraction of all BattleMechs. Iconic Assault 'Mechs include the Mackie, Atlas, and Stalker and the Clan Warhawk (Masakari) and Dire Wolf (Daishi) designs. The BattleMaster and Cyclops are well-known command 'Mechs, as both have above average electronics packages geared towards command & communication while maintaining heavy weapon payloads. Since the late 28th century, designers had attempted to construct BattleMechs in excess of 100 tons. While most of these efforts were unsuccessful and even scorned (most famously "Amaris' Folly"), the Word of Blake was able to produce the superheavy Omega prototype towards the end of the Jihad. In the early 3120s, tripodal superheavy 'Mechs called "colossal" BattleMechs began appearing as an experimental technology. Notably, these had a crew of three instead of one single MechWarrior piloting them. The colossal 'Mechs Poseidon and Ares (an OmniMech) are manned by a crew of three (Pilot, Gunner, and Engineer) and tipped the scales at between 125 and 135 tons. The known standard omni configurations of the Ares are called "Hades", "Hera", "Zeus", "Aphrodite", and "Hephaestus". OmniMechs, a concept introduced by the Clans and later adopted by the Successor States of the Inner Sphere, feature hardpoints with interchangeable weaponry whereas classic BattleMechs have a fixed configuration. Designed as combat vehicles, BattleMechs are modular to an extent and thus relatively easy to repair and maintain. Even throughout the Lostech era of the Succession Wars, scavenged battlefield salvage could keep them operational despite their technology not being understood anymore. However, changing out the weapons and equipment of a 'Mech can require extensive refitting which might result in the chance of malfunctioning. IndustrialMechs (also known as WorkMechs, UtilityMechs or, where applicable, ICE 'Mechs), though far less glamorous than their war-faring counterparts, are very important in the everyday life of the BattleTech universe. There are AgroMechs, ForestryMechs and LoggerMechs, LoaderMechs, MiningMechs, and many other types for many different industries including even armed SecurityMechs. Many of these 'Mechs use an internal combustion engine (ICE), usually diesel, due to the high cost of fusion reactors. Industrial 'Mechs have occasionally been modified for war when normal 'Mechs are out of reach (most often in the MechWarrior: Dark Age saga), although the modified WorkMech is usually far less capable than a BattleMech of the same tonnage. They tend to be equipped with relatively light armor, but can pack a deadly punch in close combat with varying array of industrial-grade tools including saws, drills and utility lasers. ↑ Interstellar Operations, p. 133, "QuadVees (Dark Age)"
This page was last edited on 16 February 2019, at 16:09.